The Miros OSD System has become a success story and has quickly been adopted by international oil recovery operators as a reliable, well verified and efficient tool when oil spill response operations are carried out. The system has been tested yearly in oil-on-water trials since 2004, giving the crew of oil spill recovery vessels automated oil spill detection, oil spill position history and estimate of future drift. During the past year the number of installations in Europe, South America, China and USA has been increased, and as of now the Miros OSD has gained interest in most parts of the world. The Miros OSD System utilises a standard marine X-band radar and advanced image processing algorithms for the detection of oil spill. The system can automatically detect and track oil spills in complete darkness, enabling 24-hours recovery and surveillance operations. Oil spill response times are shortened, the efficiency of clean-up operations is increased, and the extent of environmental impact is reduced. Behind the technology used in the system lies the fact that oil dampens the wind generated sea surface capillary waves. Because of this, the backscattered electromagnetic energy from sea surface areas covered with oil is significantly reduced. Advanced image processing of the radar signal in a multistep process enables the OSD system to filter out various types of noise and to homogenise the radar images in order to clearly distinguish between oil and water. Fig. 1. Havila Troll carrying out a dispersion operation supported by the Miros OSD System. Fig 2. 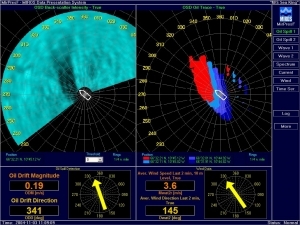 The Miros OSD System showing an oil spill together with oil drift and wind speed vectors.